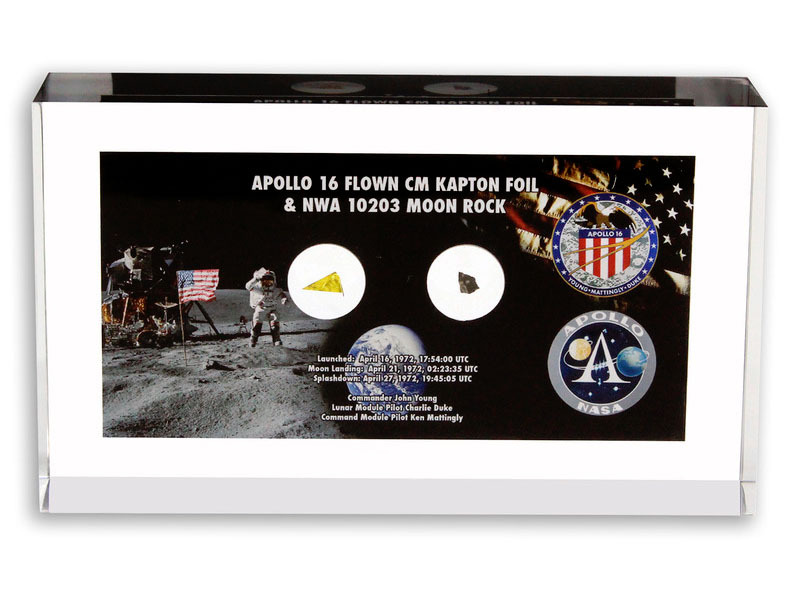 Apollo 16 Command Module Flown Kapton Foil & NWA 10203 Moon Rock Mini Lucite. Apollo 16 Flown Kapton Foil:The flown material contained within this lucite is Kapton Foil taken from the Apollo 10 Command Module "Charlie Brown" after its return to Earth. Kapton Foil, silver-coloured on the front with a gold backing, was attached to the outside skin of the Columbia in order to protect the fragile craft from the extreme environment of deep space. Because the foil was attached to the outside skin of the Charlie Brown, its silver-coloured side was directly exposed to deep space. NWA 10203 Moon Rock: The moon is constantly hit by meteorites and with no atmosphere and little gravity the larger impacts eject lunar rocks into space. After this impact, this meteorite will eventually be brought down to Earth by the Earth's gravitational pull. Scientists and universities all around the world examine meteorites and compare them with known lunar material, e.g. 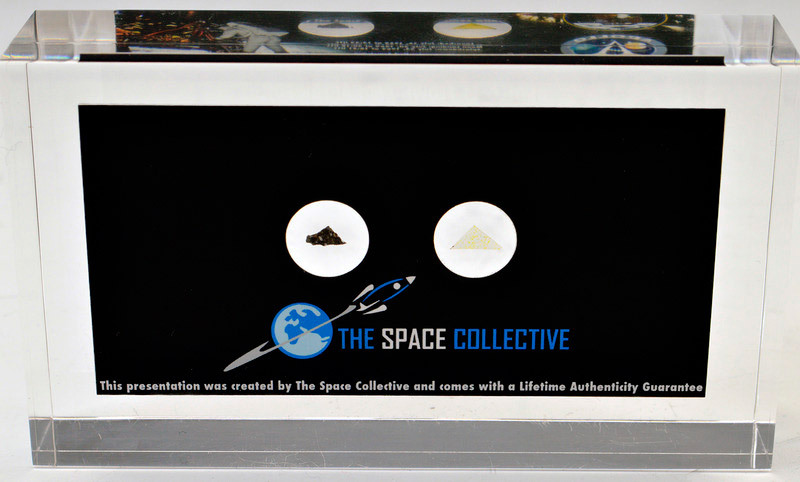 samples collected during the Apollo missions. The composition of gases and isotopes found is so unique that they can say for sure the material originated from the moon. The encased meteorite was acquired from Meteorite Hunter and Discovery Channel's ''Meteorite Men'' T.V. Star, Steve Arnold. Apollo 16 was the tenth manned mission in the United States Apollo space program, the fifth and penultimate to land on the Moon and the first to land in the lunar highlands. The second of the so-called "J missions," it was crewed by Commander John Young, Lunar Module Pilot Charles Duke and Command Module Pilot Ken Mattingly. Launched from the Kennedy Space Center in Florida at 12:54 PM EST on April 16, 1972, the mission lasted 11 days, 1 hour, and 51 minutes, and concluded at 2:45 PM EST on April 27. Young and Duke spent 71 hours�just under three days�on the lunar surface, during which they conducted three extra-vehicular activities or moonwalks, totaling 20 hours and 14 minutes. The pair drove the Lunar Roving Vehicle (LRV), the second produced and used on the Moon, 26.7 kilometers (16.6 mi). On the surface, Young and Duke collected 95.8 kilograms (211 lb) of lunar samples for return to Earth, while Command Module Pilot Ken Mattingly orbited in the Command/Service Module (CSM) above to perform observations. Mattingly spent 126 hours and 64 revolutions in lunar orbit. After Young and Duke rejoined Mattingly in lunar orbit, the crew released a subsatellite from the Service Module (SM). During the return trip to Earth, Mattingly performed a one-hour spacewalk to retrieve several film cassettes from the exterior of the Service Module.